Being a Remote Rater with Vericant means playing a role in international admissions. As a Remote Rater, you will assess the spoken English ability of international students applying to North American schools by watching video interviews and using Vericant’s Spoken English Evaluation (SEE) rubric. The Vericant Spoken English Evaluation (SEE) is an evaluation of the English language proficiency demonstrated during the Vericant Video Interview. The SEE rubric was developed from the Common European Framework of Reference for Languages (CEFR). 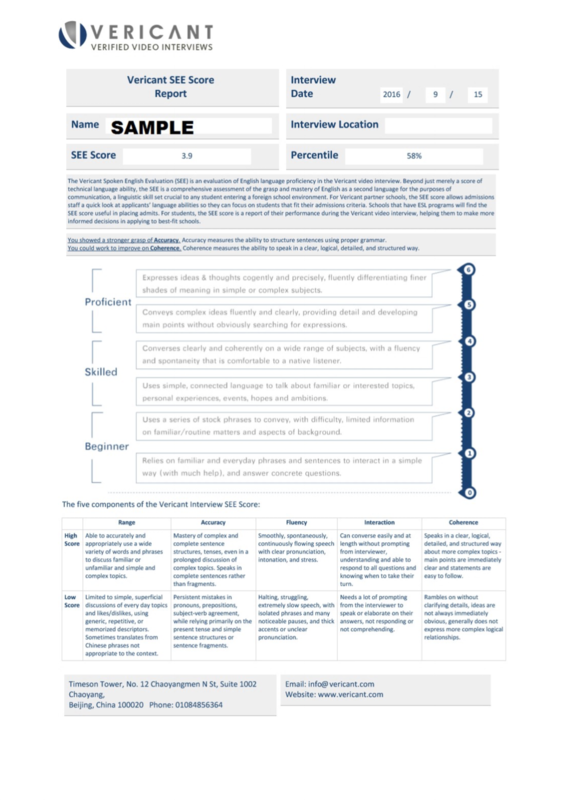 The SEE score reflects an interviewee’s ability to communicate in an interview setting across five areas: Linguistic Range, Grammatical Accuracy, Fluency, Spoken Interaction, and Coherence. Most native speakers will receive scores between 4 and 6 on the SEE rubric. A score of 5 or above indicates a socially nuanced and linguistically diverse proficiency level that is normally demonstrated by a highly educated person. The SEE score is the average of a student’s achievement in 5 areas of communicative competency, and students are given ratings of 0-6 in each of the 5 areas. Yes, I want to be a Remote Rater! All Raters are expected to maintain a minimum level of commitment to rating on a weekly basis. Raters who are not consistently logging in to rate videos will have their accounts suspended. Before becoming a Remote Rater you must undergo an online training course in order to become familiar with our rating process and to learn how to apply the SEE rubric. These training sessions occur several times a year and allow trainees to practice using the rubric as they receive feedback from instructors. Trainings also serve to help us determine who we will invite to join or team of Remote Raters. Training times will vary, but previous trainings have lasted for 4 weeks, with between five and eight hours of training per week. Videos are approximately 8-10 minuets long, so a Rater can rate between 3-5 videos an hour depending on their experience and level of difficulty in assigning scores. We recommend rating no more than 6 videos in one sitting. Remote Raters whose accuracy levels slip below minimum levels will be temporarily removed from rating real videos and placed on probation. We ask for Raters on probation to complete a series of training videos again to re-establish their rating accuracy before they can resume rating real videos. Raters on probation will not be paid for their training videos. Raters who consistently submit inaccurate ratings will risk having their accounts retired. All evaluations of video interviews will be conducted online through the Vericant Rating Portal, a secure platform on Vericant’s website. On the Rating Portal, Remote Raters will watch videos, submit ratings, and review feedback and view accuracy levels. Integrity is Vericant’s first and most important core value. since we interview many students during a critical part of their school application process, protecting student identity is a primary concern for our company. All student videos will have identifying information erased as much as possible. This includes blurring student faces in the rating videos you will be watching as a Remote Rater. Furthermore, we want Remote Raters to have no personally identifying information about the students.